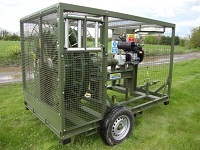 This high torque, Aerostat winch was supplied to the Saudi Military through our partner company Allsopp Helikites Ltd. 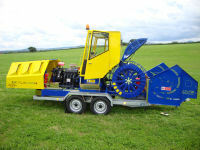 It's fitted with an extra high capacity drum, with an 800m special optic fibre cable system. This is the latest 2016/2017 Skylaunch Evo. A few more updates with a new diesel option. This particular machine was delivered recently to the Waseda University Gliding School in Japan. Skylaunch 2 EVO The new Skylaunch EVO - replaces both Skylaunch 2 and Skylaunch 3 combining the best features of both machines and introducing lots more. Major update for Burn A pretty major update on a Tost winch bringing it up to the latest specs for Burn Gliding Club. Re-engineered winch 2 A re-engineered tost awaits a final coat of paint by the club. Special projects winch for Skylifter. A full Tost rebuild A Re-engineered Tost with a complete rebuild and fitted on a Skylaunch trailer. Special projects - Aerostats Aerostat winches for defence, scientific applications, photography, publicity, radio equipment, lifting etc.